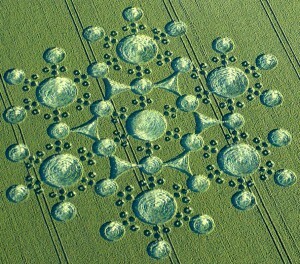 Nobel Prize Winners Predicted In Crop Circles? Collie’s illustration describing the obvious link between the White Sheet Hill CC and graphene, which can be utilized in electricity-producing photovoltaic cells. Like the Jubilee Plantation crop circle of August 15, 2011, yet another crop circle has now been identified which unquestionably refers to a Nobel Prize winning scientific discovery, and in both cases these crop circles appeared in the fields several months BEFORE THE NOBEL PRIZE WAS AWARDED. Think for a moment about the implications of this! Crop circle researcher Red Collie has described what appears to be an undeniable link between the White Sheet Hill crop circle of June 25, 2010, and the Nobel Prize – winning scientific discovery of graphene, a single-atom-thick sheet of carbon atoms which can be used to produce electricity in photovoltaic cells. “The USC Viterbi School of Engineering lab reported the large scale production of highly transparent graphene films by chemical vapor deposition in 2008. In this process, researchers create ultra-thin graphene sheets by first depositing carbon atoms in the form of graphene films on a nickel plate from methane gas. Then they lay down a protective layer of thermoplastic over the graphene layer and dissolve the nickel underneath in an acid bath. In the final step they attach the plastic-protected graphene to a very flexible polymer sheet, which can then be incorporated into an OPV cell (graphene photovoltaics). Graphene/polymer sheets have been produced that range in size up to 150 square centimeters and can be used to create dense arrays of flexible OPV cells. It may eventually be possible to run (graphene) “printing presses”, laying extensive areas covered with inexpensive (graphene) solar cells, much like newspaper presses print newspapers (roll-to-roll).”. What do we see in the White Sheet Hill crop circle? We clearly see the atomic carbon arrangement of graphene. We also see what can only be interpreted as a schematic of our sun, intercalated within the center of the atomic structure of the graphene’s atomic- carbon matrix. What else is there? Well, we see two distinct varieties of the smallest, “grapeshot” circles, all identical in size. One variety contains center tufts of standing wheat. The other variety of the smallest circles are empty. Whay might this mean? Here is what it means. The small empty circles represent Dirac holes. The small circles with central tufts represent electron filled Dirac holes. Astounding! Again, from Wikipedia: “Due to this linear (or “conical”) dispersion relation at low energies, electrons and holes near these six points, two of which are inequivalent, behave like relativistic particles described by the Dirac equation for spin 1/2 particles. Hence, the electrons and holes are called Dirac fermions, also called Graphinos, and the six corners of the Brillouin zone are called the Dirac points. Could this relationship at the 6 corners of the graphene matrix be any more elegantly illustrated than what we see in the Whitesheet Hill crop circle? As crop circle researchers like Red Collie continue to bring forward important and undeniable relationships demonstrated in the crop circles, we are confronted with information that is becoming increasingly difficult, and for me impossible, to dismiss as being simply “pranks with planks”. Which human circle makers might have known about graphene? 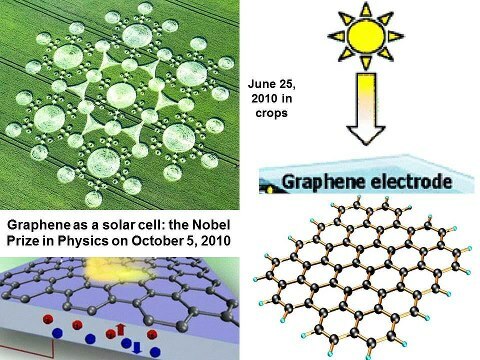 Which would have been artistic enough to design such a clever schematic which not only demonstrates the overall conformation of the graphene molecule, but also clearly references the known electronic properties of the molecule, and the potential application of graphene in the production of solar energy! Which could have then reproduced this design so perfectly, without a single error, overnight and in the darkness, in a field of wheat – and without being apprehended for vandalism? AND, how could this / these individual(s) have known about the upcoming Nobel prize which would be awarded to the discoverers of graphene, 4 months prior to that most prestigious award event?! Please take note of this: Station 5: “Nobel Laureates are chosen”. Now realize this. 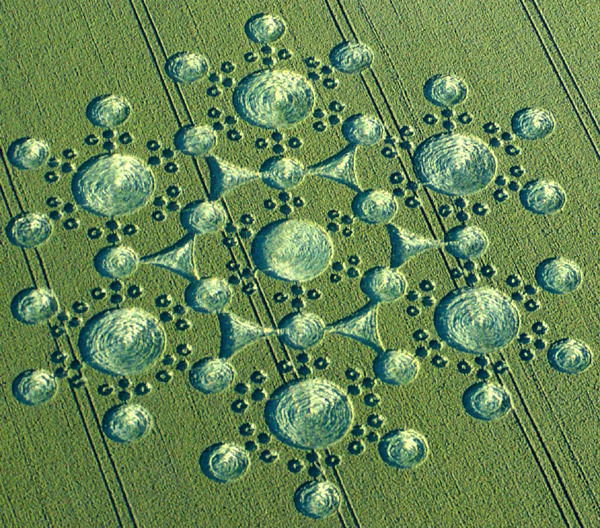 Another such temporally implausable relationship, encoding a reference to scientific work that would, later that very same year, be awarded a Nobel prize, has been previously noted in relation to the Jubilee Plantation crop circle ( see http://cropcirclesresearchfoundation.org/a-crop-circle-and-a-quasicrystal/). The first occurence of such an event in connection with Jubilee Plantation was highly suspicious – this same scenario occurring twice now is simply too much. Something otherworldly and completely foreign to our reality is going on here! Conclusion: human beings cannot be responsible for the production of the White Sheet Hill crop circle of June 25, 2010, nor of Jubilee Plantation of August 10, 2012. What’s even more important to our science is the profound implication that time travel into the future is not only possible, but there are groups of our ET visitors here with us that clearly already know how. Perhaps, through the White Sheet Hill crop circle, they are encouraging us to move toward a method of producing energy using graphene-based photovoltaics that will help us free our civilization from the dirty fossil fuels we are currently using to produce the energy we require. When will our world begin to pay attention? The Wrekin is a hill near the town of Telford, in Shropshire. It dominates the surrounding area, standing at 400 metres, and is a [url=http://authenticcheapchristianlouboutinshoessale.webs.com]black christian louboutin spike pumps[/url] very popular spot for walking and family picnics. The hill is such a landmark, that the local council is called ‘Telford and Wrekin’. The History of the WrekinThe Wrekin has always been important to the people living nearby. Starting in the Bronze Age, the Cornovii tribe of Celts used the hill as a hill fort, only giving it up with the Roman invasion of the 1st Century. The Roman army defeated the last owner of the fort, Virico, and called their own fort (built 4 miles to the south) Viroconium to honour their enemy. In Saxon and Norman times, the Wrekin became part of the Royal Forest. Tolkien enjoyed walks on its slopes when he lived in nearby Penkridge. It has been claimed that the hill and surrounding countryside provided Tolkien with inspiration for the ‘The Shire’ of the Lord of the Rings and The Hobbit novels. Nowadays the Wrekin is very dear to the hearts of the locals. For many a homesick traveller, the Wrekin is the first sign that they are nearly home. It is also the root of two Shropshire sayings: ‘Going all round the Wrekin’ which means taking a lot of words to say something simple, and the Shropshire toast, ‘all friends round the Wrekin’. The Wrekin has been designated a Site of Special Scientific Interest (SSSI) due to the ancient woodland that clings to its lower slopes which contains bluebells, wood anemone, wood sorrel, toothwort, yellow archangel and golden saxifrage along with ancient yew. Plenty of birds can be seen on the hill, including tawny owls, woodpeckers, ravens and buzzards to name but a few. Even fallow deer can sometimes be seen in the woods. The Wrekin is also the site of a television and radio transmission mast that, although some want it removed, makes the Wrekin distinctive and instantly recognisible. The Geology of the WrekinAlthough made of layers of volcanic rock and ash nearly a mile thick, the Wrekin is not actually a volcano. The actual vent that formed the hill has long-since disappeared, however the hill is close to the Church Stretton fault which, when active, would have caused numerous volcanic eruptions and earthquakes in the area. The locals still experience minor earthquakes once in a while as the fault shifts slightly. The Wrekin can boast the best preserved Uriconian1 exposures in the country, and ripples of sandstone that once formed a beach can also bee seen on its slopes. The Myth of the WrekinMost large local landmarks have legends surrounding them, and the Wrekin is no exception. The legend concerns the creation of the Wrekin. The story tells that a Welsh giant held a grudge against Shrewsbury2 and decided to take his revenge on the people there. He took a huge shovel full of soil, with which he wanted to dam the river Severn and so drown the inhabitants of the town, and set off walking. On his way there, he met a cobbler, and asked him how far he still had to go to get to Shrewsbury. The cobbler, realising the giant’s intentions, showed the giant his bag of shoes to be mended, and said ‘I’ve come [url=http://authenticcheapchristianlouboutinshoessale.webs.com]authentic christian louboutin mens shoes[/url] from Shrewsbury, and I’ve worn out all these shoes walking from there to here.’ The giant decided it was too far to walk, and so dumped his soil where he stood, turned round, and went home. That pile of soil is now the Wrekin. Getting ThereFirst, you need to get to Shropshire. That part is very easy – both Telford and Shrewsbury have good railway links to the rest of the UK, and the A49, A5, A53 and A458 all make the county easy to get to by car, along with the M54 which links to the M6. Once in Shropshire, make your way to Telford on the M54. Turn off the M54 at junction 7, and follow the signs for Little Wenlock, until you find the Wrekin car park.